The first installment in a series of close-ups on the 2011 Aboriginal People's Choice Awards nominees by category. Another year has passed and here we are at the second round of voting for the Aboriginal People's Choice Awards. In honour of the organizers, all the artists and the many loyal voters, we bring to you a playlist of and introduction to the artists involved in the second round of voting. First, the category of Best New Artist. Ali Fontaine - Ali is a 17 year old Country artist from Sagkeeng First Nation in Manitoba, Canada. Managed by Errol Ranville, a prominent veteran musician out of Manitoba and front for the legendary C-Weed Band, she is set to make some waves in the music scene this year. This is Ali's first time as a nominee in the APCMA's but we're quite sure we'll be seeing a lot more of her in the future. CerAmony - Coming from the James Bay Cree, CerAmony have done their people proud as ambassadors by winning a 2011 Juno for Best Aboriginal Artist. Using their musical talent to bring light to social and political issues in their community, they have become hometown heroes and a driving force behind Canadian Indigenous music. Cris Derksen - Hailing from the North Tall Cree Reserve in Alberta, Cris Derksen is a classically trained cellist earning herself a Bachelor Of Music in Cello Performance at the University of British Columbia. Alongside her academic achievements, she has toured the world with her unique style of cello artistry and has shared the stage with many great artists such as Tanya Tagaq, played at the 2010 Winter Olympics and maintains a steady touring schedule around Turtle Island and beyond. Diyet - A member of the Kluane First Nation in the Yukon of Canada, Diyet is an accomplished songwriter from the community of Burwash Landing. Her songs have been heard all over the world and she has worked hard to earn a degree in music from the University of Victoria. Sticking close to her roots, Diyet brings us a blend of rock and traditional music that is a pure commentary on the future of contemporary Indigenous music. Ghostkeeper- Based out of Calgary, Ghostkeeper unites the genres of Blues and Pop, creating an original sound that has impacted the music scene in a huge way in the last couple of years. Focusing on strong storytelling and song writing, they have polished their sound to where they want it and are pushing ahead in the music world. Congrats from RPM.fm to all the artists for making it to the second round! 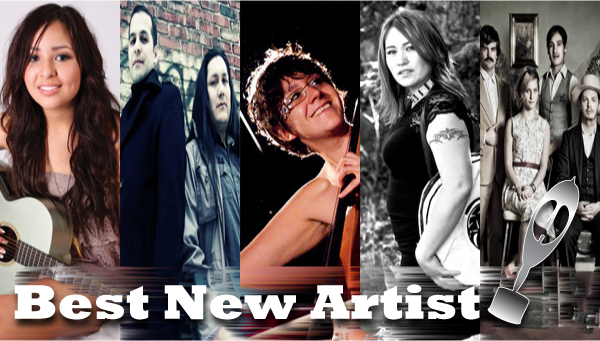 Stay tuned for more info and playlists from the 2011 Aboriginal People's Choice Awards nominees in the coming weeks. Who do you think will win the 2011 APCMA Best New Artist Award? Leave a comment below. VIDEO: Yelawolf - "No Hands"